This course is intended for all staff (nurses, doctors, allied health professionals) who work with neurological patients who have sustained a spinal cord injury. This course aims to provide specialist moving and handling advice on how undertake a log roll technique for a spinal injured patient. The purpose of the log roll is to maintain alignment of the whole spine while turning and moving a patient with a spinal injury. Information regarding the national care guidelines will be provided. Demonstration and practical hands on practice with specialist equipment will be provided. This training will form part of your statutory mandatory training when you attend the full day. This course is an excellent development opportunity for both qualified staff and health care support workers. Your link workers will help you to build best practice for patient safety and dignity during handling, as well as promote staff safety and wellbeing. 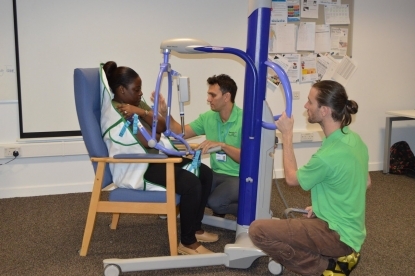 Course recommended for: Physiotherapist, Occupational Therapist , Therapy assistants. This course aims to provide specific specialist moving and handling advice for manual and therapeutic handling risks faced by therapists in challenging handling situations. Demonstration and practical hands on practice with specialist equipment will be provided. This training will form part of your statutory mandatory training. 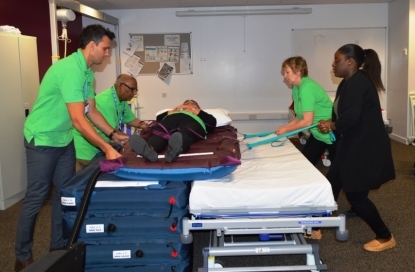 This half day workshop will enable delegates to develop appropriate Moving and Handling techniques for themselves and the patient following a patient fall. Delegates will also have the opportunity to review their clinical post fall care in a simulation area.